A previous study suggested that birds prefer seeds or nuts that are heavier or denser (Heinrich et al, 1997), but there has been very little research in the ensuing twenty years into which sensory cues are used by birds to make these important decisions. 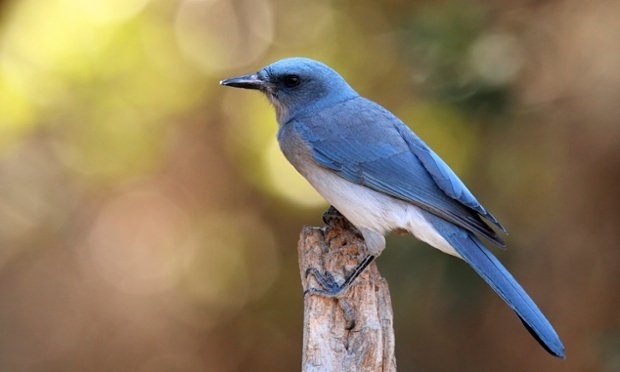 To investigate, an international team of scientists from South Korea and Poland conducted field studies with Mexican jays, Aphelocoma wollweberi, to better understand how these food-caching birds identify nutritious seeds without first opening the shells to inspect the contents. Mexican jays are largish songbirds that have a long blue tail, blue wings and head, a blue-grey mantle, a pale grey breast and underparts. Mexican jays are cooperative breeders where several subadults help tend the nestlings produced by the dominant pair in the group. Most of these helpers are offspring of the dominant pair from earlier years, but unrelated individuals will also join a group and help raise the young. Although Mexican jays are omnivorous, they do cache acorns and nuts throughout the late summer and autumn that serve as their primary food during the winter. The research team studied nine such groups of Mexican jays living on the arid eastern slopes of the Chiricahua Mountains in Arizona. These birds are individually colour-banded and have been trained to approach their own particular feeding arena in response to the sound of a police whistle. Sunflower seeds, acorns and peanuts are provided at each feeding arena that the birds can carry away and cache nearby. 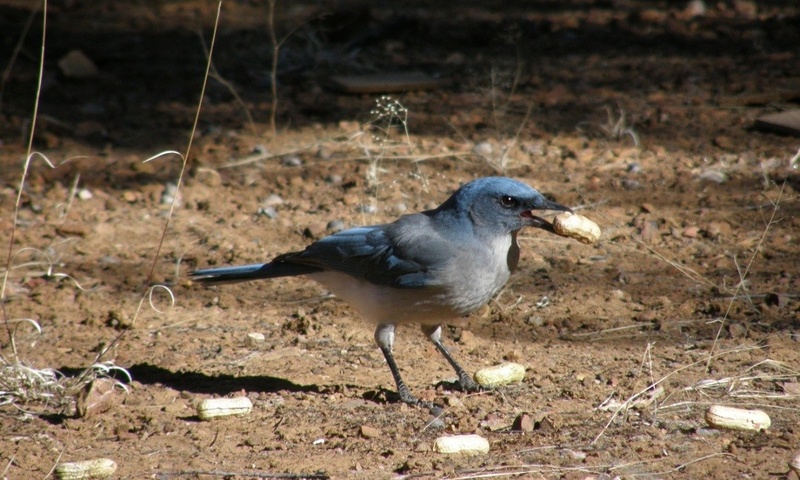 The team designed three tests that were repeated hundreds times (using tens of thousands of peanuts) in 2008, 2009 and 2012 in the nine jay groups, to evaluate the sorts of information that the birds might be learning by handling peanuts. First, the team tested whether the birds could identify if similarly-sized peanuts contained nutmeats simply by looking at them. To do this, they gave the jays 20 similarly-sized peanuts, ten of which had been emptied of nutmeats and the pods superglued closed, whilst the other ten had been opened, the nutmeats glued to the pod interior to prevent rattling, and their pods superglued closed. In this experiment, the “normal” peanuts were 4 times heavier than the empty peanuts. Second, the team tested whether the jays could distinguish between similarly-sized peanuts with a normal mass or with a slightly heavier mass than normal. To do this, they provided the birds with 20 similarly-sized peanuts that had been weighed. Ten of these peanuts were of “normal” mass and had been opened, the nutmeats glued to the pod interior and superglued closed, and ten peanuts were 1.6 times (1 gram) heavier than “normal”. The heavy peanuts were prepared by putting non-toxic clay inside each pod before they were superglued closed. Third, the team tested whether the jays chose peanuts visually based solely on size. They provided the jays with 20 peanuts, ten of which were small, containing only a single nutmeat, and ten of which were large, containing three nutmeats. As before, the team opened each peanut, glued the nutmeat to the pod interior and superglued the pods closed. But before resealing the pods of the “triple” peanuts, they removed two of the three nutmeats so all peanuts, regardless of size, had similar masses. The team filmed the jays with a portable high-speed camera (250 frames per second, and occasionally 500 or 1000 fps) to capture minuscule details of how the birds handled peanuts. The team later analysed the films to identify whether (and by how much) the birds opened and closed their beaks when handling a peanut, and estimated the velocity of the beak when it closed on the peanut pod. The videos revealed that the jays evaluated each peanut whilst handling it by using very fast beak and head movements. In the first and second experiments, the birds consistently chose heavier peanuts. When provided peanuts that were obviously different in size, as in the third experiment, the jays handled the larger peanuts before rejecting them and choosing the smaller peanuts. “The jays figured out that the larger pods did not weigh as much as they should and the birds preferred the smaller pods, which weighed as expected for their size”, said the study’s co-author Elzbieta Fuszara, a biologist at the University of Warsaw, in a press release. She noted that, basically, the birds behaved as if they knew that “something is wrong” with the larger nuts. Preliminary analyses of the data suggest an alternative explanation for how the jays decided which peanut to cache. “Although the peanuts in our experiments had similar mass and look, they produce different sounds during handling”, write the authors in their paper. Further, despite gluing the nutmeats inside the pods to prevent them rattling, the birds created sounds by rapidly clicking their beaks on the peanuts. In short, birds choose the best seeds and nuts to store away for a snowy day by using the same sensory cues used by melon-thumping humans in a supermarket. This entry was posted in Behavior, Birds, Evolution, Journal Club and tagged Aphelocoma wollweberi, Mexican jay. Bookmark the permalink.